Although slavery is illegal pretty much everywhere, this horrendous practice hasn’t died yet. It has just got a different name: human trafficking. Traffickers operate all over the world, which means there are still slaves in every country, including the USA, the UK, and Italy. With some of them, like those forced to work in restaurants or as nannies for free, we may even had had some contact, without realising it. 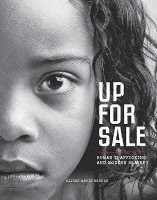 In this short book, Alison Behnke provides an insightful overview about all the different types of human trafficking, from prostitution to forced labour, from illegal adoption to organ trade, and more. The author explains how slaves are recruited. There are several ways. Some of them have been sold by their poor families. Some have contracted debts, which seem to grow rather than diminish with time, they are forced to repay with their work. Some are recruited with lies and false promises, while others are kidnapped. In Up For Sale, Benhke shares some of their heartbreaking stories, the ordeals they went through, and the struggles they face, once free, to build a normal life. The book highlights a social issue that too many of us are unaware of, thinking that slavery is something that happens only in far away countries and doesn’t involve us. But a lot of the goods, including foods, apparel, and electronics, we buy are made with forced, sometimes even child, labour. A lot of the prostitutes on our streets are there against their will, and so are the domestic helpers in many families. They live among us like ghosts, suffering unobserved. But it doesn’t have to be like that. Benhke explains how to recognize these slaves and what you can do to help them. Even just calling anonymously the authorities to voice doubts can help. If you’re looking for an in-depth study of slavery you won’t find it in Up For Sale. There is nothing that groundbreaking or new here, at least not for those who are already familiar with the topic. Instead, Up For Sale is for those people who have never given slavery much thought before. It’s a starter book that will present them with the main facts and statistics about slavery, along with the stories of ex-slaves to help make the phenomenon more realistic for the reader. At the end, it also lists a few resources for those who want to know what products are made with forced labour, how to get in touch with organizations who are helping victims, and more. The topic is dealt with in a very delicate manner that doesn’t overwhelm you. Highly recommended. Depression runs in my family. I am the child of a depressed parent and have suffered from depression myself. Therefore, I know all too well what a devastating impact depression has on all the members of the family, and the stigma associated with this illness, which too often prevents sufferers from seeking the help they need. The topic is, obviously, very close to my heart and, for a few years now, I’ve been reading everything I could find about it. But never before had I come across a book that deals specifically with the challenges and consequences that growing up with a depressed parent brings. Although everyone has a different experience, children of the depressed tend to have several issues in common. For instance, they tend to suffer from poor self-esteem and negative self-talk, have bad communication skills, and problems setting boundaries. Some people may react by running away from their childhood forever, while others may feel like they have to please and take care of everyone around them, all the time. Bennett helps readers understand where these issues are coming from and provides several useful tools, such as SCARS (it stands for stop, congratulate yourself, apologize to yourself, replace the destructive distortion, and smile) and how to buy yourself time when you feel under pressure. These exercises can be really tough, especially at first, because they force you to be honest with yourself and face your demons and fears. But doing them is the only way to get better. That doesn’t mean that you should do them all though. As mentioned above, everyone’s story is different, so not all the tools outlined here will be as helpful to everyone. Try them all at first, and, once you’ve found those who work the best for you and your situation, stick to them. Bennett doesn’t preach. She too is a child of the depressed and has suffered from depression herself. Now, as a therapist, she helps people overcome the issues that stem from their and their parents’ illness. She knows what she’s talking about, and that sufferers need both understanding and encouragement to take the necessary actions to change their lives. The tone of her book reflects that. Bennett never judges. Instead, she tells you that it’s ok to be sceptical and it’s ok to take all the time you need to heal. You’ll feel like you’re talking to a friend rather than a therapist. If you too are, or think you may be, a child of a depressed parent, or know someone who is, I highly recommend you pick up this book. It will help you understand why you, or your loved ones, have such self-destructive behaviours and how you can overcome them to live a better, happier, more fulfilled life. Highly recommended. Let’s face it: who you know is just as important, if not more, than what you know. After all, it doesn’t matter how talented or well-educated you are, if noone knows who you are, you won’t get hired or given the opportunities you need to make your dreams come true. That’s where networking comes in. The word has, unfortunately, gained an undeserved bad reputation. Asking for a favour to someone you barely paid any attention to before is not networking. Networking is all about forging meaningful relationships with people who may one day help you but without expecting anything in return. The key to networking is caring about people and providing value for them. Thanks to the internet and new technologies, these days everyone can connect with anyone. In this book, Judy Robinett explains how. After explaining what networking is, and debunking some of the most common myths about it, the author shares lots of useful tips on how you can connect with strangers, both in real life and online; how to organize a large network; how to stay in contact with all the people in it; how to behave at conferences and on the most popular social networks; and how to provide value to your contacts. There’s also a section that highlights how differently men and women network. Robinnett is a power connector that, thanks to her contacts and her ability to use them properly, has been able to achieve her dreams and help a lot of people do the same. Here, she shares a lot of those stories to make readers see how powerful, and how easy, networking really is. She writes in a really engaging and straightforward way that never bores nor preaches. Instead, she encourages you to get out of your comfort zone, and start connecting with new people all the time. After all, you never know who you may meet. What’s sure is that a good network will enrich your life in many ways. Overall, this is one of the best, and most comprehensive, books on the topic. If you’re interested in improving your networking skills, I highly recommend you pick it up.